Numerous cultivars of mandevilla (Mandevilla spp.) are woody vines enjoyed for their showy, sometimes fragrant flowers. Mandevillas can grow outdoors as perennial vines in U.S. Department of Agriculture plant hardiness zones 9 through 11 and are potentially overwintered indoors successfully in cooler areas. These vines are less aggressive than many other vining or climbing plants, as they climb using a twining habit rather than sending out anchoring roots or tendrils, making them ideal for growers who like to maintain some control over their plants while still enjoying vigorous growth and exceptional ornamental value. Place a trellis or other support near the mandevilla at the time of or shortly after planting or plant the mandevilla near an existing trellis, post or other support. Remove any ties or small stakes that were sold with the mandevilla. Cut off excessive stems back to just above the soil surface or where they meet the main stem, retaining three healthy, upright stems. If there is only one main stem on the young plant, cut it back to within 1 to 2 feet of the soil surface to encourage branching. Make any cut just above a bud, leaf or stem junction. Pinch back the tips of young, vigorous shoots, especially where growth is thin, to encourage dense, bushier growth. Use your thumb and a fingernail to pinch off about 1 inch of growth at each stem tip, positioning your pinching just above a bud or leaf. Tie the mandevilla stems loosely to the parts of the trellis where you want them to climb using soft fabric ties or, when a the stem is long enough and still sufficiently pliable, gently wrap the stem around the portion of the trellis you want it to cling to. Regularly bending the stems gently and weaving them through the trellis or support horizontally encourages denser growth. 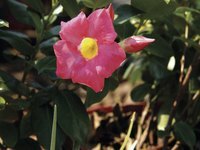 Monitor the mandevilla, inspecting the plant regularly to find any shoots that are growing in an undesirable direction or will give the plant an uneven appearance. Gently unwind the mandevilla stems that are beginning to grow in an undesirable direction and carefully wrap them around the portion of the trellis where you want them to be, using soft fabric ties to hold them in place, if necessary. Cut back stems that are growing out of bounds to contain the plant while also encouraging denser or bushier growth in that spot. Again, make any cut just above a leaf, bud or stem junction. Cut back the oldest stems on the plant to almost ground level and cut back the remaining stems severely in late fall or early spring before new growth emerges if you are growing the mandevilla as a perennial vine.